Emelie Schepp, Swedish Crime Writer of the Year 2016 explains how she was inspired by the news story in Sweden of a truck with a container that had overturned on a highway full of refugees. How this made her think about lost people and how they are vulnerable to manipulation. Thinking of a good story it is not always about how a victim was murdered, it is the characters and the interaction between characters readers remember. 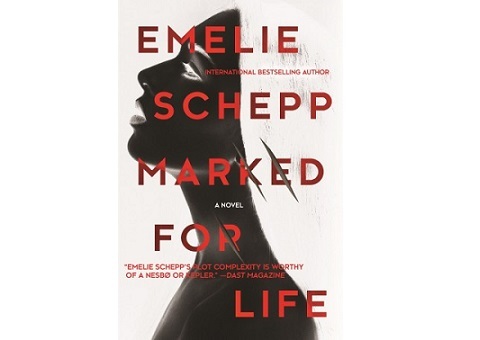 In my debut novel Marked for Life I wanted to write about a woman that was odd. But I did not know how odd she was about to be until I read an article about child soldiers. In 2012 there was a huge debate about child soldiers after the movie "Kony 2012" went viral. The movie was about Joseph R. Kony who is the leader of the Lord's Resistance Army (LRA) a guerrilla group that formerly operated in Uganda. Joseph R. Kony has been accused by government entities of ordering the abduction of children to become child soldiers. Over 66 000 children became soldiers. As I read the article I remember that I started questioning myself: " How is it possible to turn an innocent child into a soldier? What happens when a child is forced to kill and commit other acts of violence? And what happens if a solider want to be a child again? Is it even possible? Or are you “marked for life”? I also started to think about what would happen if there were child soldiers in Sweden. And if I wanted to use child soldiers in my writing, where in Sweden could I find children? I know it sounds very strange, but I had to find children that no one would miss, nor search for. To abduct a child in a playground would lead to a media storm – I wanted the abduction to take place in secret, without anyone knowing. One evening as I watched the news I saw a truck with a container that had overturned on a highway. And when the police arrived at the scene they found several refugees in the container. They had not been registered at the border. They were illegal. No one knew they were in Sweden. So, I went down to the port of Norrköping and looked around. When I saw all the thousands of containers I realized that everything could be hiding in them, including children, that’s how I come up with the story about Jana Berzelius. I wanted to tell a story of how Jana Berzelius and other children can be shaped into something they were not born to become. Children are incredibly loyal, particularly to the hand that feeds them and I understood that such loyalty can be lifelong. I tell a story about immigrant children that are smuggled into Sweden and disappear without a trace. The sad thing is that this actually happens in Sweden today. Because of the large flow of immigration, smuggling and human trafficking are increasing. Desperate people who have decided to flee and have put their life savings toward succeeding won’t be stopped. They have nothing to lose and nothing to return to. They want to achieve their dream of a better future and will do everything to reach it. They will travel down roads that do not exist - on water, through fences, past walls. They risk their lives and many never make it; they die on the road. Adults and children disappear, are kidnapped, are taken away and are forced into a life of prostitution or slavery. Human traffickers profit on people in peril. And people in peril will do whatever to reach their dream. Their motivation is far stronger than that of those who try to stop them. In my second book, Marked for Revenge, I write about the young woman Pim who, in her dream of a better life, agree to smuggle drugs. So, in both Marked for Life and Marked for Revenge I write about young people who are forced into different paths they weren’t born to follow. More information about the author can be found on her website.